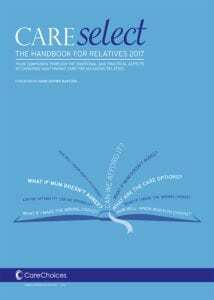 The handbook for relatives, Care Select is a guide to help people whose ageing relatives need care and support. It can guide you through arranging care, getting the whole family to agree, funding care for the elderly and deciding on end of life care. Developed to support people to navigate the social care system, Care Select explains how to get a care assessment, what types of care are available and much more. If your parents need care and you live far away from them, or if your husband or wife needs support, Care Select can help you. The companion guide explores both the emotional and practical aspects of care and support for your relatives, while the accompanying website provides you with a list of useful contacts and a search feature to help you find care near your relatives.